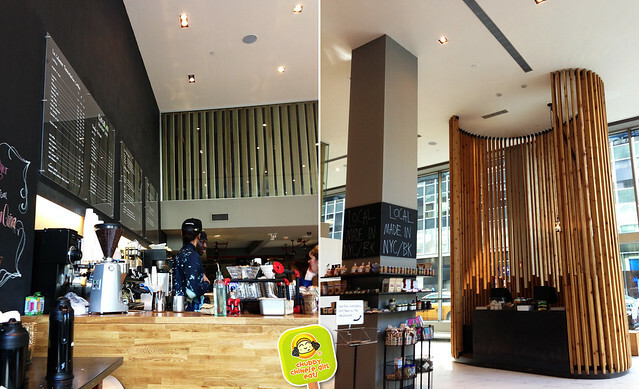 Treehaus is my favorite new addition to the Midtown East area. Totally unlike the usual Asian deli (so tired of those duplicate copies). The space is bright, airy and it feels like being in Brooklyn. Sweet coffee shop in the front, juice bar, futuristic steam table on the side (American comfort with a French twist) and tons of different food choices in the back. Most of the products are local, NY and BK made. I saw a few of my Smorgasburg favorites like the The Good Batch cookies. Van Leeuwen, Blue Marble ice cream, and those bacon peanut brittles. Can’t wait to stock up the office fridge. I giggled like a little girl from this side of the counter as I saw my all time favorite Passion Fruit with Cocoa Nibs. These are the best donuts in NY (yes, even better than Doughnut Plant). Dough’s yeast doughnuts are extra fluffy and airy, unlike their ordinary counterpart. Plus, they come in creative palate pleasing flavors like dulce de leche, blood orange , hibiscus etc. They cost a bit more than the chain store ones, but totally worth the extra dough (LOL, I had to go there). No comparison there. Passion fruit with Cocoa Nibs has a perfect balance of sweet and tart. Not overly sweet. The fragrant passion fruit melts in your mouth and that fruity tartness is just enough to make your lips pucker. A bite of cloud like softness with a bit of a bouncy texture. The cocoa nibs adds that little crunch. Washing it all down with a strong cup of creamy latte is highly recommended. Talk about an afternoon pick me up. This will be my new favorite “routine”. 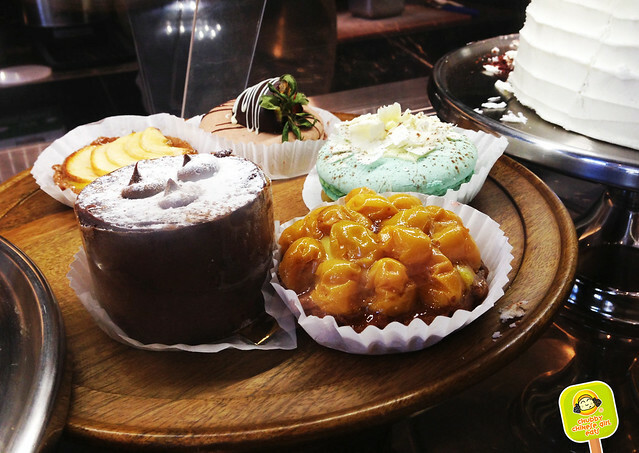 The other desserts looked really alluring as well… I must go back and try them all, it’s a tough one, but will have to take one for the team. 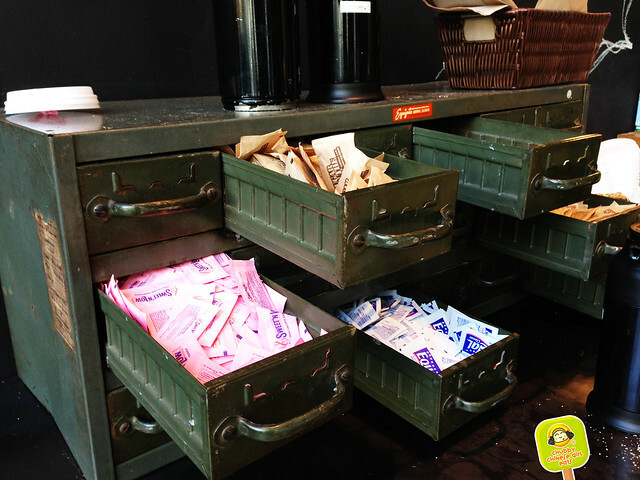 Great way to recycle old cabinets! Love the creativity in their decor. Will keep you guys posted on how the food is. In the mean time, my afternoon treats went up a notch. Sweet! 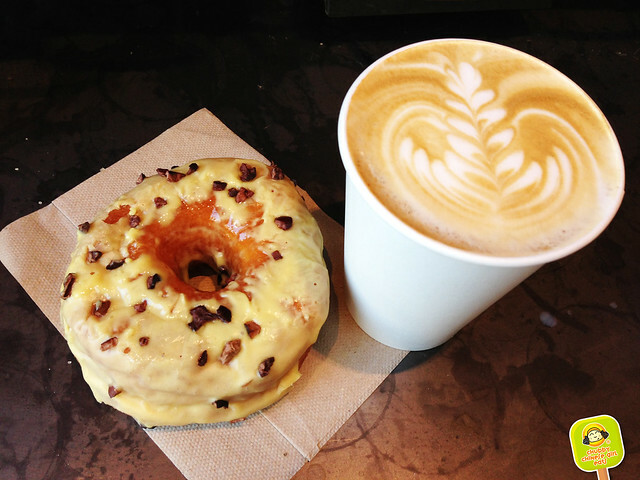 Rating for Dough donuts and latte. Will have to go back and try the food.